Japan meets Mexico with this innovative recipe. Serve it as canapés, entrée or main. You decide. With its full-bodied flavours and basic presentation, you can surely have some fun with it. 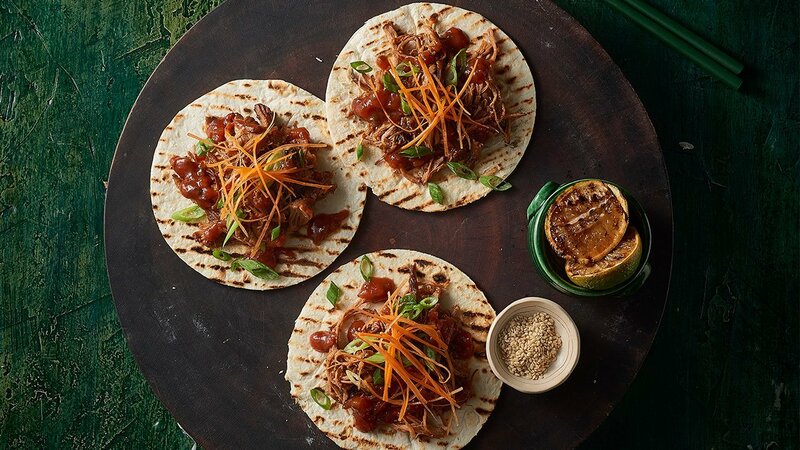 Combine soy sauce, KNORR Gluten Free Pronto Napoli, KNORR Professional Mixed Chilli Puree, KNORR Professional Garlic Puree and KNORR Professional Ginger Puree, hosin, kecap manis, coriander roots and pour over pork shoulder in a deep gastronome tray. Place lid on top and braise in oven on 150 degrees for around four hours (or until meat falls apart). Grill carnitas until warm. Place the pulled pork on top and drizzle with KNORR Mexican Chunky Salsa Mild GF. Top with cabbage, shallots and carrot.